* Chose a color that can be easily coordinated with your sartorial choice of the day. While black is the most common and obvious choice, I urge you to step out of the box and go for a different color choice. Grey is a very versatile option and you will find it blends more easily with the colors in your outfit. * Shape is a very important factor as well. Stick to the classics and you cannot go wrong. While odd shaped or novelty bags might be all the rage this season, you want something you can carry for multiple seasons or even years. * Size matters! Be mindful of what you actually need to carry with you on a day to day basis and get rid of unnecessary stuff - you don't want to feel like carrying a bag full of bricks. Unless you are carrying your laptop, go for a small or medium size to get that polished look. * Look for quality when it comes to bags, in order to make your investment worthwhile. Make sure you pick good quality leather but also keep an eye on the quality of the handles, straps, clasps, locks and lining. * Shop smart and check out the sales. If you are eyeing that designer bag of your dreams but cannot afford it full price, wait until it goes on sale or hunt for special offers. The wait will be well worth it and your budget won't suffer... that much. I've been carrying this bag for two weeks now and managed to make it work with all my outfits. Here I have incorporated it in a very casual ensemble, something I would wear while running errands. Hope you guys like it! 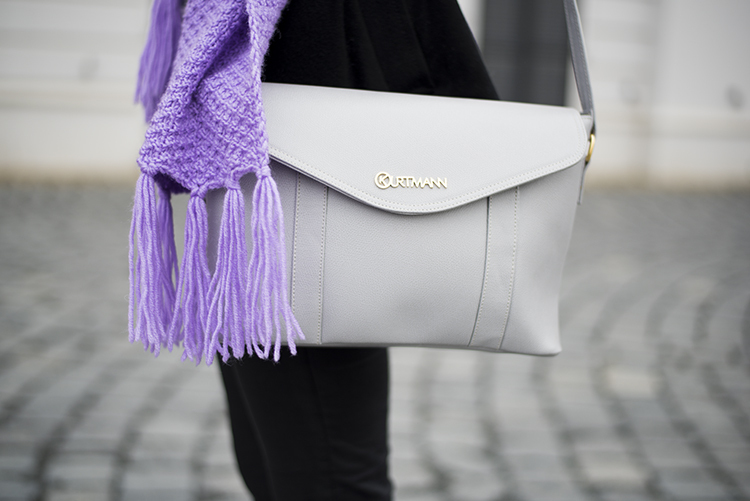 Such a gorgeous bag, I love the color! i like the bag but i love the scarf ... good job ! That purple shade looks great on you! It is actually surprising the way in which some of our perceptions own adjusted is not really it all? Lake was initially the younger calico apparel were definitely which means that famous together with That i anxiously wished for an individual. My father says hardly any, it does not matter the way in which really hard That i begged.